I'm a software developer! Check out my portfolio! Learn about my skills, my tools, and my experience. 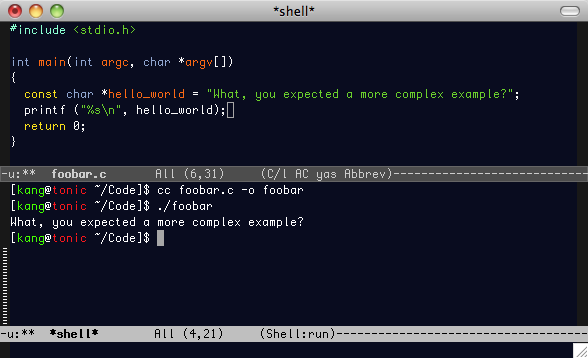 One ridiculously cheesy emacs session. Trust me, things get more exciting. I get a huge kick out of making computers do interesting things, whether the benefit is for myself or others. With a diverse toolkit, a wealth of experience, and a wide support network, I'm able to make meaningful contributions when it comes to web software and technology. I'm currently taking on new clients to assist in these areas, and more. Here are some of the most common technologies and programming languages I'm experienced with. When performance is a priority. Beautiful code. A pleasure to read and write. Rapid webapp development using Ruby on Rails. Arguably the most widely-used web scripting language. Rapid webapp development using CakePHP. Most modern web frameworks hide the database layer from you. Despite this, you should always know how to get your hands dirty. Developers can do amazing things in the browser these days. Your algorithms may be killer, you aren't going to get anywhere without a decent UI. Long ago I lost some important code because I wasn't using version control. Never again, thanks. Hell, this paragraph you're reading now is checked into git. Cross-browser testing is hard enough when you're writing valid W3C code, so why write something invalid without a good reason? TCP/IP, HTTP, SSH... all the classics. Caching, gzipped content, CSS sprites, compressed JS served via content distribution networks... whatever it takes to keep things loading fast! A bit about my past work and education. I worked on a multitude of projects during my time at Snap. At first, my focus was on crawling and indexing the web, while our main product was a search engine. My team focused on creating a custom database to store our search index, crawling software to efficiently and politely harvest web content, HTML parsers, as well as search relevancy algorithms for servicing user queries. C and Perl were my go-to languages during this time. Snap Shots has been installed on millions of websites and blog networks, including TechCrunch, Wordpress.com, LiveJournal, Xanga, and more. During peak hours, hundreds of Shots might be served per second! Snap LinkAds gave me my first exposure to the internet advertising business. I spent a lot of time working on machine learning techniques. If we have millions of possible ads we can show for a given ad unit impression, and millions of ad unit impressions, how can we quickly learn which ad configurations are working so that we only show the best performers? Instead of writing a thesis, each student in the HMC CS Department participates in a clinic project. Students form small teams and spend a full school year working for an industry client, with guidance from a faculty advisor. During clinic, I served as Project Manager on a research project for Laserfiche — an industry leader in document management solutions — under the supervision of Professor Zachary Dodds. The project focused on developing distributed search algorithms for use in large document databases, using a modified version of Apache Lucene.